I have for you today one of the new polishes from the Mirror range from Aussie brand BYS. I picked this up before I left for HK when I was getting some things for swaps and couldn't resist getting this for myself as it was new. The Mirror range consists of 3 foil polishes - a silver, a red and a bronzey/gold foil. They are supposed to give your nails "reflective shine" and make them the "hottest nails of all". Yay for shiny nails! I'm a sucker for silver so naturally I picked the silver which is called Disco Ball . 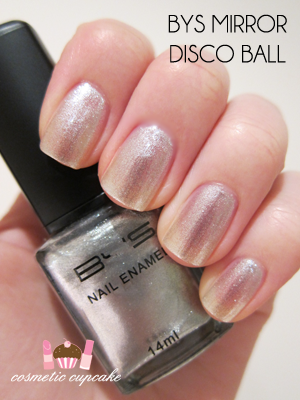 Disco Ball is a very shiny silver foil with plenty of very fine silver glitter packed in, giving it a somewhat roughish finish. It applied very nicely with no need for cleanup and it dried quickly too. Above is 2 coats with some VNL so 3 coats would probably be best for opacity. I only did 2 as I was going to layer a crack polish over the top which I shall show you in my next post so make sure you do check back. Unfortunately the "Y" in BYS on the front didn't come with my bottle but rest assured the brand isn't "BS" haha. It's a great silver foil however it's nothing we haven't seen before. Ulta 3 Snazzle is one in my collection that is similar so I probably should have picked up the bronze or red foil polish instead doh! However I think it does a pretty good job being reflective. See the shadows on my nails?? I'm pretty sure that's my head being reflected!! Must stop humming it now lol. Thanks for looking! Hahahaha I love that you wanted to break out in song. This colour is ok, but I prefer the one you did in your last post MUCHOS more. Reflective nails? *raised eyebrows* Somehow I was expecting more with that range. @Mez: I liked Show It and Glow It! a lot more too! You can't go past an awesome blingy glitter. @Leah: What a coincidence Leah! Great minds think alike ;) I will have to try it as a topcoat over black or something. Disco Ball didn't blow me away unfortunately but it's certainly a nice polish. @Joan: It wasn't as foil as I had hoped but it's still a nice polish. I wonder what the other 2 polishes from the range are like!